After we traveled in Cha-Am and the surrounding area for years, we would like to present you the highlights of the most beautiful excursion destinations and festivals on video. First and foremost, we have nature videos and wildlife films, also movies focused on Buddhism and Buddhist holidays. All movies can be downloaded free of charge for private use. A commercial use is strictly forbidden! The small romantic fishing village in Cha-Am is worth a trip at any time of day or night! On day you can watch the hardworking fishermen up close at work and at night you can use the long promenade for romantic walks. About 40 kilometers away from Cha-Am, in the city of Phetchaburi, this magical cave lies hidden deep in a mountain. For countless years it is used already as a place of withdrawal, of meditation, of contemplation sweep. Come with us, join us to the magical journey inside the cave! 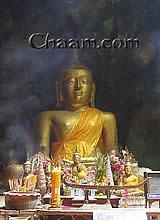 The videos about Cha-Am and the most beautiful excursion destinations are constantly completed. Subscribe to us on Youtube or follow us on Facebook, then you'll never miss a new episode! Just a few kilometers outside of Cha-Am, you will find a mountain that is perforated like a Swiss cheese. There are numerous caves, where countless bats are nesting in it. Night after night, around ten million bats fly out on the nightly trip to find food. In the temple on the way from Cha-Am to Puek Tian, which has the shape of a ship, Wat Tanot Luang, every year the Wai Kru takes place. In this buddhistic ceremony amulets get blessed and filled with magical energy. This happens due to the bundled concentrations of the monks who put themselves with their monk singing in a kind of trance deep meditation. They are all connected with a white string, one end of the string is connected to the abbot Luang Phor Yorn and the other end to the amulets. The abbot is in deep meditation during the ceremony.